The only way to properly store your car. When you live in the Northern New Jersey area leaving your Classic or Exotic car outside over winter isn’t an option. Snow, hail, tree branches and all the other elements that your car would be subjected to, if stored outside, is definitely cause for concern. So you need somewhere and someone you can trust, PowerPortal is the only place you want to trust. We provide the highest quality, safest, indoor, climate controlled storage. When your car comes into P3 for storage we want to make sure it’s clean. We place your car with proper preparation, which includes Sta-Bil in your fuel, battery trickle charge, fluids checked, proper air pressure, a clean dust free cover and a breathable plastic cover over the cloth to keep dust away from the cloth, Steel wool in open orifices to keep mice from entering and desiccant in the cabin and trunk to absorb moisture, and more. Ask our professional staff to detail the full process when you call or stop in. Or click the “Chat” button to the right. 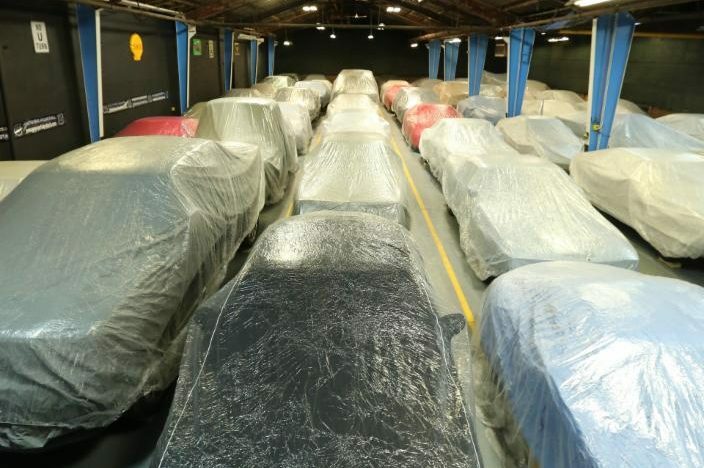 Sleep soundly at night knowing that your baby is safe and sound in our Hackettstown, NJ classic car storage facility. We are fully insured and protected by full fire and burglary and a dry fire suppression system for maximum security. As a guest of PowerPortal, you’ll have 24/7 access to a web based video surveillance system from your PC, Tablet or Smartphone. You have the added benefit of viewing your vehicle being prepped for you in our Staging Lane if you’ve requested access for your weekend trip or show event. When you are ready to put your car into storage, we will pick it up in our enclosed trailer. The same goes for taking your classic out of storage. We’ll deliver your car to you fueled up, fluids and air pressures checked along with an eight point safety check. Toss your bags in the trunk and hit the road. If you purchase an extended stay storage package and need to pull out sooner than expected, your unused time is NEVER FORFIETED. You can “Bank” it up to a full 12 months from your date of departure. Save that time for next season, your summer vacation or any in-house services PowerPortal Offers. Banked time IS NOT vehicle specific. Take the Porsche and leave us the Minivan. Our new facility in Hackettstown is conveniently located on Route 57 only minutes away from responding fire and police departments. We have nine responding fire houses within 8 miles. The first being only ½ mile away. The NJ state Police and the Mansfield Twp. Police Department are less than 5 miles away.